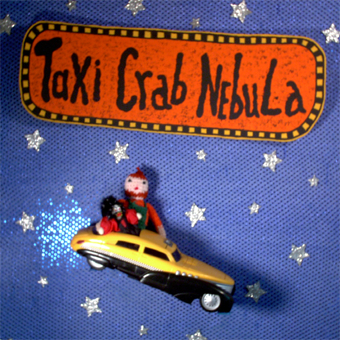 Even though I had recorded on my own before many times, in many ways, I consider TAXI CRAB NEBULA to be the first record that I produced. It and NAUGAHYDE DREAM SEQUENCE were my first attempts at making a protools record, and they were hard learning experiences. I would not do it the same way, now. NDS especially was a labor of love, editing things the hard way and literally dragging and dropping a zillion notes by hand and nudging them into place. TCN, though was the very first one since learning protools and doing it like the "pros" do in world class studios today...or at least trying to! In 1999 when I joined MINISTRY, they used Studio Logic software to create recordings, but around 2000-01 they switched to Protools and Barker and I learned how to use the program together. I was hooked. Apple had fixed the issues that I had had with their midi-based computer software back in the 1980’s (which is why I had given up on computers for a time in the 1990’s). So I was really excited about that. Around that time I was involved with MINISTRY and several other local Austin bands, as well as several recording projects. I kind of wanted to make a record like Robert Fripp had, where every song was with a different group of musicians. By the end, though, I was wanting to do an album with Biscuit and one group in the background, which is how NAUGAHYDE DREAM SEQUENCE started. But that’s another story. The reason I say this though, is because it was a challenge trying to make the album sound ok from one song to the next song when each one was made with a different entire setup, some of it very primitive. 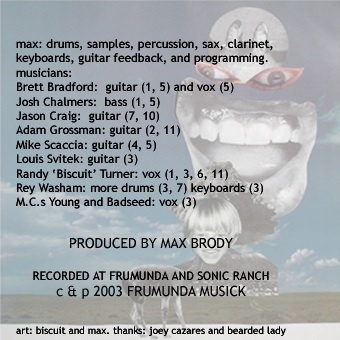 For the record, MC BADSEED and YOUNG were the drum tech out at SONIC RANCH and a buddy of his who blabbed their way onto the recording one night with some dirty martinis and smoke and general ridiculousness that made me laugh, so it stayed. The interrupter is BISCUIT... Pretty silly stuff...but, um... I can't say I intend on doing any more music in that vein...ahem...Also, the name was made up by BISCUIT. 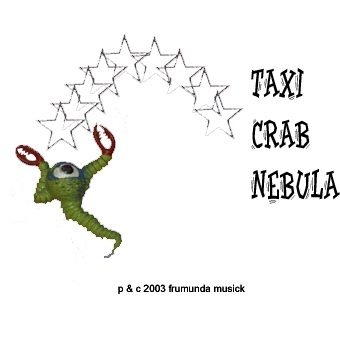 TAXI CRAB NEBULA was recorded during 2001 and 2002 in various locations with as many of my friends as I could muster. Made in such wonderful places including my south Austin apartment, Biscuit’s house, south Austin rehearsal rooms, the MINISTRY tour bus, dressing rooms, hotel rooms, and even at the world class Sonic Ranch in west Texas, it was made for fun and exploration. So, it is what it is. I’m still proud of it, and I hope you enjoy.